Exactly how this nickname reflects the city, located Linz on the Danube, as hardly any other Austrian city. In 2014 and 2015, the European Capital of Culture 2009 presents, in all the diversity and the centerpiece of Europe's second largest river - the beautiful diverse Danube. In Linz, namely the Danube turns and changes direction - right here is changing. It is indeed no coincidence that there arose a city that also has undergone so many changes? 'Lentos' or 'Lentia', Celtic and Roman name of Linz. Both indicate the change of flow direction. Linz is changing, not only themselves, but also their visitors and residents. The Danube is currently in Upper Austria far more than just a fascinating and beautiful river landscape stretching from Schlögenské loop through Linecká pan until a picturesque area in Strudengau Grein. Like the proverbial red thread runs also through the history of Linz and further into the future. For centuries, the river was alternately dividing lines and link cultures and regions along its banks. In Linz remained still alive pioneering spirit of former patrons of culture. In Linz is home to many leading and internationally successful businesses. The city is today the center of the European region Danube-Vltava. 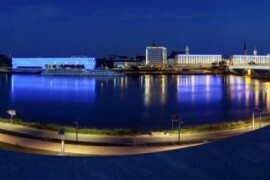 Linz is an example for the whole of Europe that the Danube is a dynamic linking culture and economy. There have feelings for Europe. The Danube is the stage of life, which is important but also slowing the tempo and comfortable travel. Passengers on the water, bike along the famous Danube cycle path and pedestrian walkway on the Danube tourists, visitors to the city and its residents are also perceived historical consciousness. Also, the culture of food and drink is closely connected with the history of the Danube. The tradition of coffee with cake Linz, as well as Vienna and Viennese schnitzel. The level of the river and its flow is best know how generously the right direction Linz developed and in relation to the river. Here it Danube longer a blue, but variegated. And not just at night when the lighting for productions in the water reflects the unmistakeable outline of cultural buildings as Brucknerhaus, Lentos Art Museum and Ars Electronica Center. Danube in Linz is a space for art - open-air museum, where the striking buildings ranks next to each artwork world format ("Metall Forum" 1977 in Danube Park). In 2014, showcasing museums, theaters and festivals, exhibitions, performances and themes of the Danube. All visitors are invited to discover the new. To explore the historical, cultural and other contexts exciting way and all the senses to enrich your stay sensory knowledge and new content. Reflections of the past at the level of the Danube Linz uses the perspectives for the future. A successful and vibrant city contributes to new knowledge and use of the potential and the links in this European flow.